Siegfried King developed a plan to evaluate the feasibility of making one winery a net-zero energy building as part of Jackson Family Wines’ goal to achieve 50% renewable electricity across its winery, vineyard and offices company-wide by 2021. Jackson Family Wines (JFW), a family-owned and operated company, takes pride in making superior quality, handmade wines through long-term stewardship of the land. As part of its principle of sustainability, the company enlisted EDF Climate Corps fellow Siegfried King to analyze its 2015 GHG emissions inventory and develop a plan to achieve 25% reduction in Scope 1 & 2 emissions by 2020. He was also tasked with weighing the feasibility of turning the main bottling winery in Santa Rosa into a Net Zero building. 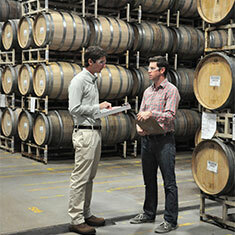 Siegfried conducted an energy audit of JFW’s bottling winery to understand how the building operates. Based on his findings, Siegfried suggested a combination of energy efficiency measures, including an LED lighting retrofit for four buildings, and renewable generation by installing two new on-site solar systems. Siegfried also discovered that the facility was losing over 730,000 kWh of electricity every year due to air infiltration--all buildings must maintain a temperature of 55F, but many doors were left open, making this difficult. To combat this, he suggested installing rapid roll up doors for those with high traffic, as well as encouraging behavioral changes to keep doors closed when not in use. Having identified these immediate opportunities, Siegfried began working on a GHG emissions reduction plan. He focused on JFW’s mobile sources (Scope 1) and its bottles (Scope 3), the two activities that account for the majority of emissions. The LED lighting retrofit could save JFW +100 kWh per year over the combined surface space of +480 sqft. The company can also add an additional 1.18 MW to its existing 2 MW of installed solar capacity through the two new two solar installations. Although the bottling building is not is not an ideal location for a Net Zero building, the facility could reduce its dependence from the grid by as much as 60%. Siegfried King is a Chilean mechanical engineer and a current Master of Environmental Management Candidate at Yale University. He has 4+ years of work experience in renewable energy and energy efficiency projects in both Chile and Germany. At Yale, he is focusing on how corporations can include sustainability into their business strategy.